Please contact this committee BEFORE you intend to build, construct or place any permanent or temporary structure on your property to avoid additional costs to correct a violation. The ACC meets the last Tuesday of every month, except December. Unless notified, all meetings are at 7:00 PM, at the Clubhouse. The Architectural Control Committee (A.C.C.) is an appointed committee that serves to promote and ensure the high level of taste, design, quality and conformity that lies within our neighborhood. Prior to making any improvement to your property, you must request written approval from the A.C.C. The A.C.C. utilizes the Declaration of Covenants, Conditions Restrictions as the guideline for approving all requests. Every homeowner should have received a copy of the declaration of Covenants, Conditions & Restrictions with their settlement papers at closing. 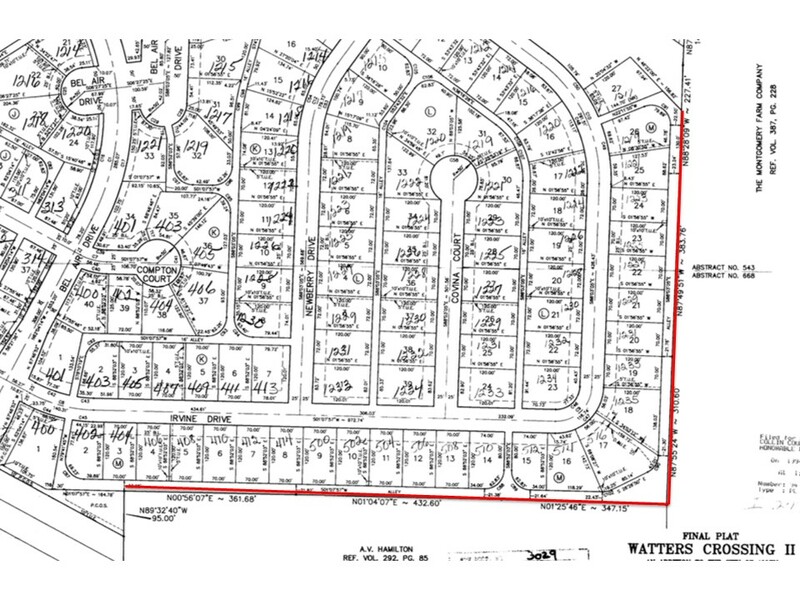 Execution of a document agreeing to abide by these Covenants is a condition of receipt of title to property in Watters Crossing. Please read these documents carefully. If you have misplaced your Declaration of Covenants, Conditions and Restrictions, you may purchase another copy by requesting this in writing to our Association Secretary. Please include a check in the amount of $25.00 made payable to the Watters Crossing Homeowners Association. You may also download a free copy using the link below this section. There is no WCHOA Private Common Open Space nor any land in the rear of your property that is maintained by the WCHOA. However, there is an easement which we will outline below. While these properties go to the rear property line, live trees cannot be removed nor can anything be built on the last ten feet of the property. 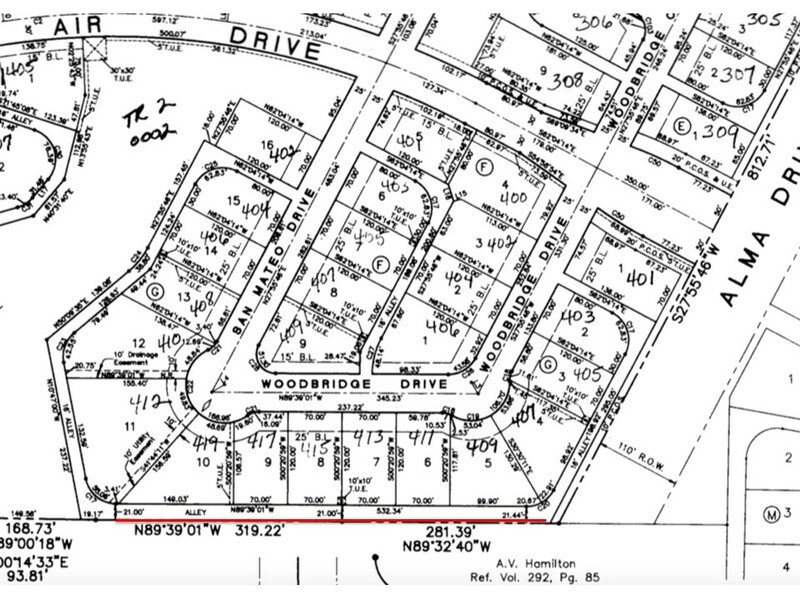 The ten foot section then continues on the opposite side of the property line which is shared with either Montgomery Farm or the individual homeowner in back of you. Specific details on this can be found at www.collincad.org in the interactive map link. To summarize, the wooded area in the rear of these property is a protected easement, intended to remain in its natural condition. 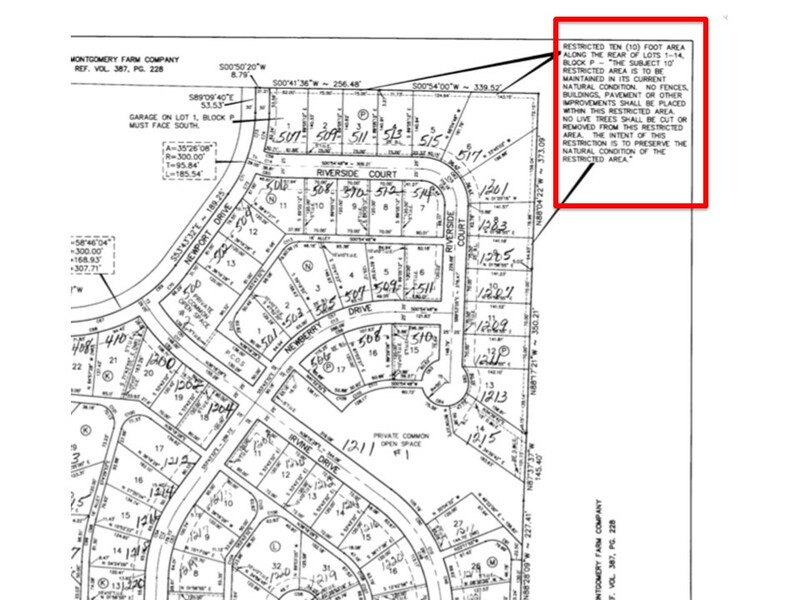 The area is not part of the Watters Crossing Private Common Open Space and the HOA does not maintain the area. 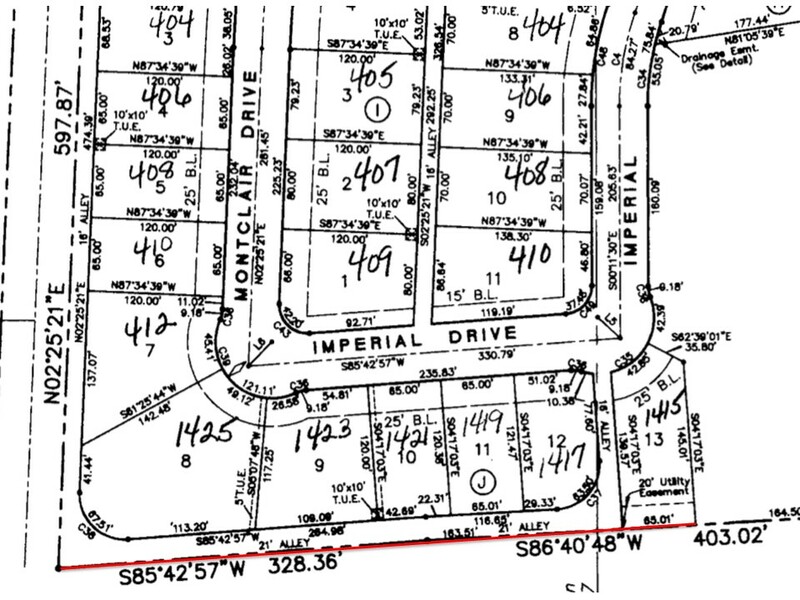 The protected area is owned by the individual homeowner of the lots called out and are under the restrictions noted. EXCEPTION: 1215 Riverside Court is included in the protected easement, BUT does have WCHOA Private Common Open Space owned and maintained by WCHOA on the side adjacent to the pond. 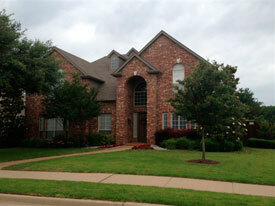 The above properties are effected by a Drainage and Utility Easement in the rear of each property. 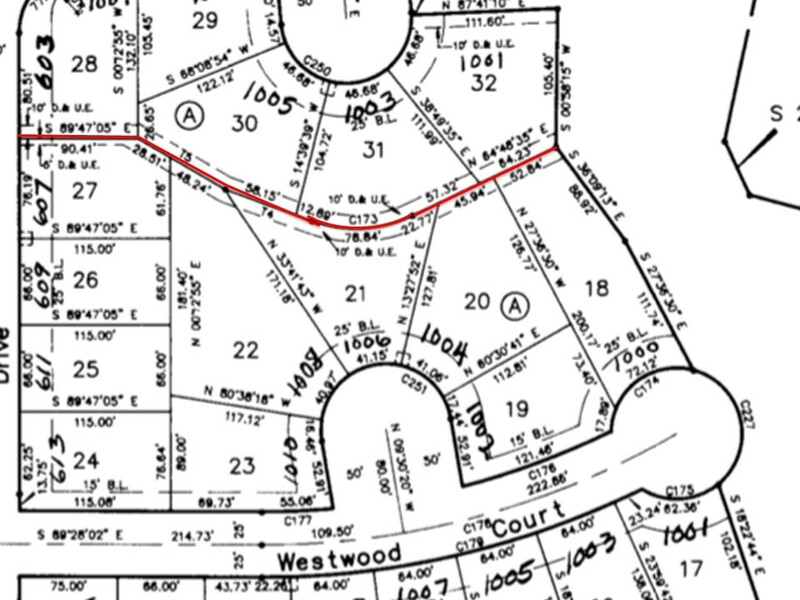 As the attached plat illustrates, each property listed above shares a common property line with one, or more, of the other property owners listed above. Ten feet on each side of that propery line is the Drainage and Utility Easement. There is no WCHOA Private Common Open Space in this area. As such, there is no WCHOA maintained area. Removing fallen trees and keeping the drainage easement open is the responsibility of the individual homeowner(s). Fence panel(s), which is a minimum of six feet in height and four feet wide (width is minimum and is dependant upon concealment). This is the preferable course of action. 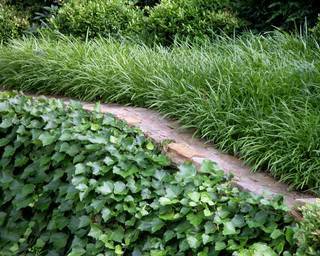 An evergreen shrub / landscaping that results in complete concealment within one (1) growing season. Unfortunately, option two has been less than successful in ensuring compliance with Section 4.7.u in many instances. Due to this and to ensure that Section 4.7.u is equally applied to all, effective 1/1/2015, the ACC will no longer accept new landscaping as a means of HVAC or mechanical equipment concealment. We will grandfather all HVAC equipment where landscaping is in place to provide for concealment for one additional year to allow for that years growth. After 1/1/2016, all HVAC equipments that is not completely concealed by landscaping will be considered to be in violation of Section 4.7.u. The concealment will need to be completed via option 1 above (fencing). 1/1/2015: New landscaping will no longer be approved by the ACC as a means of HVAC concealment. The members of the ACC believe this will improve the appearance of Watters Crossing by satisfying the specifics in Section 4.7.u. Thanks for your understanding and help in making Watters Crossing such a great neighborhood in which to live. Do You have areas where Grass won't Grow? 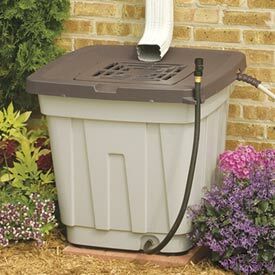 The ACC accepts rain barrel installations. The preferred location is within the rear, fenced in yard locations. These will be accepted on the sides of properties when completely concealed by a six (6) foot to eight (8) foot tall, solid fence panel. The width of the panel is determined as needed for concealment. The ACC accepts solar roof panels. Indeed, the third home, located in Phase III, was recently approved for installation. Panels will be mounted on rear, or in some cases, side roofs. The ACC accepts plans for yard renovations / reconstructions using drought tolerant, low water usage plants, ground covers and more. As with all exterior improvements, any of the above must be submitted to the ACC for review and approval prior to any construction commencing. Project submissions now are easy using the online forms and most projects are expedited within the committee via email. Project forms provide the ability to upload photos, plats, and other supporting documents. The ACC thanks you for working within the Review Guidelines of Watters Crossing. With a primary election scheduled for March 6, 2018, political signs are popping up in Watters Crossing. Size and types of signs permitted are outlined in the Texas Property Code. These cannot be installed more than 90 days prior to the election date and must be removed within ten days of the election date. A home is permitted one (1) For Sale sign no larger than five square feet. Realtor guidance on signing is shown in the Realtor link at www.watterscrossing.com Realtor signs and open house signs installed in the entrance monuments will be removed. Signs for yard sales, yards, sales, etc. are never permitted within Watters Crossing. We urge homeowners to participate in one or more of the two annual Community Wide Yard Sales which your HOA schedules each year. In 2018, these sales are Saturday, May 5 and Saturday, September 22. All yard sale signs installed at other times will be removed. Signs for all contractors, trades, etc, are never permitted within Watters Crossing and will be removed. Please be aware that all roof replacements must be reviewed and approved by the Architectural Control Committee (ACC) prior to work commencing. It is not necessary to wait until the next scheduled ACC meeting for review. Roof replacements are typically expedited by the ACC. Please utilize the Roof Replacement Form at www.watterscrossing.com for expediting a review. Note that roofs planned in the color "Weathered Wood" will be approved within two days. All other colors will require a color photo or link. The online forms permit the uploading of photos with plans. All contractor yard signs are PROHIBITED by the Declaration of Covenants, Conditions, and Restrictions of Watters Crossing. The installation of such signs will result in cancellation of the approval of your project. Please instruct your contractor accordingly.